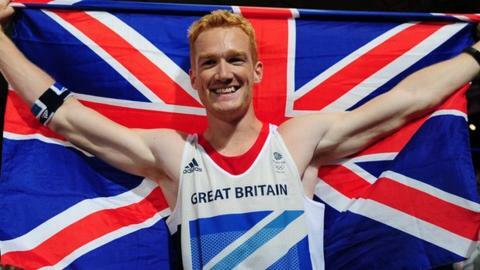 Greg Rutherford plans to switch to track cycling after he retires from athletics this summer. The London 2012 long jump champion announced his retirement from the sport due to persistent injuries, but says he still has the "power" for cycling. Rutherford, 31, hopes to end his 13-year athletics career at the European Championships in Berlin in August. He said: "My body is damaged when it comes to jumping but I can push a lot of power on a bike." Rutherford plans to take part in track cycling testing but is under "no illusions" he will be able to make his switch from the sandpit a success. "I can currently sit on a bike and do a lot through that," Rutherford told the Today programme on BBC Radio 4. "If possible I will do testing and give track cycling a go and then have a few more years in sport. I am under no illusions it will all work out though." The former Strictly Come Dancing contestant is also keen to explore a future in broadcasting. He said: "It is something that has always interested me and I have a few different shows coming up, not just in track and field, as I have an interest in history." The 2014 Commonwealth gold medallist now aims to be fit enough to compete for a third European gold at this year's championships in Berlin. He later told BBC Radio 5 live: "I'm lucky in that European long-jumping isn't as strong as it has been in recent years so if I can get back to 75-80%, where I have been in previous years, there's still a chance for me. "But if I can't, which we'll know within the next few weeks, then I'm very happy to let somebody else take my spot and enjoy it from the sofa." Rutherford claimed his Olympic gold medal at London 2012 on Super Saturday, becoming the first British man to win long jump gold since Lynn Davies in 1964. His victory was sandwiched between Jessica Ennis-Hill's in the heptathlon and Mo Farah's 10,000-metre triumph, on a memorable night for British athletics. Rutherford admits it is the "end of a era" as Ennis-Hill and Farah have retired from the track in the past 18 months, with the latter now focused on road racing. He said: "It's a natural progression in sport. Me and Jess were in the same team from juniors, Mo was a bit older. A lot of the guys I grew up with have retired. "But we're lucky there's a bunch of very good young athletes coming through who could be more successful than us over the next 10 years, rather than what it had been for a while, just being the three of us. "I get 'thank you' a lot because of Super Saturday. It's the emotions it seems to evoke in people when they think back to those moments. And Super Saturday is one of those, it always makes me smile. The London Olympics was the biggest moment of my life."